Kivalina, a village facing coastal erosion. Image via Flickr. The impacts of rapid climate change are numerous and significant. In the Arctic region, these changes are apparent and felt greatly in the decrease of sea ice because the Arctic sea ice provides regulating services (it helps regulate Earth’s energy budget and controls a number of coastal processes); provisioning services (it is a marine mammal, fish and freshwater source); cultural services (it is a source of subsistence and educational activities); and supporting services (such as soil formation and nutrition cycling). Impacts from decreasing sea ice on Alaska coastal villages have been immense. The US federal government is soon to transition under new leadership, calling into question how the new administration will approach climate policy, the plight of climate-displaced populations and US involvement in the Arctic region in general. Since global warming lags emissions of greenhouse gases by several decades due to a warming in the pipeline that is already bound to happen even if human input drastically drops, policy considerations must urgently take into account avenues to stop this trend and to mitigate present and future damages. Simultaneously, since this warming trend and its impacts are certain to continue and in fact intensify over the coming decades, innovative adaptation strategies must also be considered. The future of the Arctic is not so different from the future of any other region: Careful strategies for long-term well-being must be carefully balanced with the available resources and the needs of today, with the caveat that a slow-moving disaster is unfolding and the course of action only gets more difficult to plan with the passing of time. However, the past of the Arctic is unique in how it has occupied the imagination in line with dominant political winds and tendencies of modern history. An evolution that has seen the Arctic as a barren frontier for conquest, then as a region with purely strategic defense potential, then again as a frontier but for scientific exploration, tended to regard the region through the lens of security. Recently, and thanks to the work of Arctic Council member states and Permanent Participants, this evolution has culminated in a broad portfolio of understanding that Arctic security has meanings far beyond the military to include energy security, environmental security, food security and human rights. This intellectual growth holds important lessons for those slated to write the next chapters in the future of the region, at a time when the Arctic Council chairmanship is set to transition once more, shortly after the US presidency too changes hands – with likely major changes in coming policies. The coming four years of domestic policies will be especially crucial to the livelihoods of Alaska communities, while US cooperation with international agreements such as the 2015 Paris Agreement bears both immediate and long-term global and local impacts. President-elect Trump’s leadership should build on the previous administration’s exhaustive work for the Arctic region because history has taught us valuable lessons about the need for continuity, investing for the future by taking the long view, and the role of science in building regional cooperation. These lessons have shown that it is a folly to operate without a keen familiarity with one’s environment, to try go at it alone when collaboration yields mutual benefits, or to take trench positions. These three points mean that science of the Arctic must bolster policy of the Arctic, that cooperation works better than isolationism, and that the complex Arctic human-environment system requires careful blending of economic policies with environmental ones, and of natural resource management policies with the needs of traditional subsistence economies. The very evolution of the Arctic Council is evidence that the above can be a formula for peaceful, collaborative outcomes. President Obama’s administration has navigated the Arctic Council Chairmanship very effectively on these principles, and President-elect Trump is well-positioned to continue on this path. On the heels of news that in Scott Pruitt, President-elect Trump has appointed a staunch climate science opponent to head the U.S. Environmental Protection Agency (EPA), one must ponder not only the future of climate policies, the enforcement of existing environmental regulations, but equally importantly, the potential harm inflicted on the collective climate standpoint of the American people. Effective policies that mitigate climate hazards to vulnerable populations cannot happen without public backing. In a developed country where still only roughly 30% of people accept the scientific fact that human activity has had a major influence on climate change despite overwhelming scientific consensus on the matter, political demagoguery has proven itself an effective method for manufacturing uncertainties. Worryingly, Myron Ebell also has a long history of leading a campaign of disinformation driven by political interests aimed to discredit actual climate scientists. This history includes advising the Bush administration to bury the 2000 National Climate Assessment while scapegoating the EPA – the very agency he is now in charge of transitioning. Such affinity for political framing of scientific facts is not as much shocking as it is alarming, because there has never been a greater, more legitimate need for scientific expertise and less room for politicising science-based federal agencies. The Arctic is warming at twice the rate of the rest of the world, rapidly becoming a laboratory for climate science and climate action. 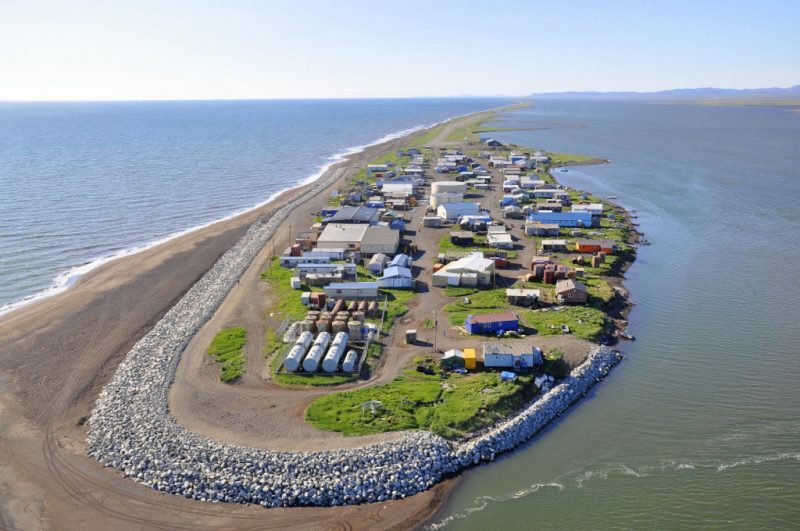 In Alaska, dozens of coastal and riverine villages are in imminent danger from erosion due to retreating sea ice, with many already forced to take the decision to relocate, but without the funds to do so. A major barrier to federal assistance is the statutory limitations of the Stafford Act (PL-93-288) in declaring erosion-induced hazards a disaster. Recent changes have made available federal grants for disaster mitigation, but Alaska communities have low populations compared with high costs of relocation, thus diminishing their chances of securing funds in a competitive process. The State of Alaska has created a Climate Change Impact Mitigation Program to fund the planning stages of relocation but it does not provide institutional or financial assistance with the implementation of the plan. The village of Kivalina unsuccessfully brought suit against several oil, coal and gas companies in 2008, while Shishmaref has invested $16 million in shore protection projects since 1973 without sufficient progress in mitigating the hazards. Newtok has begun the relocation of twelve houses but the logistics of the move are immense and lack required funding. The US as an Arctic state has a prime opportunity to demonstrate good leadership to its own citizens who are facing displacement and threats to food security from climate change impacts, and also to the rest of the world set to tackle similar challenges. The incoming US administration should lead the American public via policies based on the scientific facts of anthropogenic climate change and by building on already developing momentum for US Arctic policy. Scientific transparency and accurate portrayal of scientific consensus conceding the validity of man-made climate change is crucial to the future of the Arctic region, and should be reflected in administrative and legislative actions, outnumbering those that don’t 9 to 1. Scientific panels, and advisors of the consensus cohort versus the ones contesting it, should follow a similar pattern. Anything less would be a deliberate attempt on science and, ultimately, on human rights: It is only when a problem is recognised to exist that it may begin to also exist legally with liability and compensation gaining validity. Scientific risk assessment may indeed be a potential partner to Arctic communities by positively contributing to locally available capital via an innovative risk attribution framework. In this model, disaster and loss mechanisms and liability discussions are based on dynamic analyses of risk over time and space, establishing a basis for compensation in the future calculated from sources and sinks of risks. The mantra of “we can’t attribute any single weather event to global warming” is no longer quite true, thanks to the rapidly evolving science behind risk attribution. While an event may not be attributed solely to anthropogenic climate change, as a product of multiple base-state factors that were enhanced by anthropogenic ones, the field of risk attribution has made great progress in modeling if and when it was a key factor. As the popular analogy goes, much like a baseball player’s performance will be enhanced by steroids such that he will be stronger and hit more home runs than before – and we may observe a correlation over time – so do anthropogenic greenhouse gas emissions change the background state of the climate system, and we may model the shifting probability of the climate system towards extreme heat and precipitation events. While a single home run (or weather event) cannot be attributed solely to steroid use (or anthropogenic greenhouse gas emissions), one can provide attribution for a subset of analysed events with a high level of confidence. Such analysis of Arctic sea ice melt with regards to the role of anthropogenic forcing has yielded promising results; good news perhaps for coastal communities impacted by erosion secondary to reduced sea ice extent. Though to date, there exists no global liability and compensatory platform for climate impacts -nation states expect sovereign planning and actions to ensure sovereign outcomes without binding transboundary liability and compensation obligations (near impossible goals in a world where risks are interwoven and the “no harm rule” is getting harder to observe) – a new international loss and damage mechanism has been set up to provide limited assistance to developing countries in mitigating and adapting to climate change impacts. This state-level assistance is mostly technical and diplomatic in nature, though it includes a target financial pledge from developed countries. But risk attribution has potential to make possible cross-sectoral compensatory frameworks to include liable industry and consumers of specific products in a tax scheme that provides continuous support for worst-impacted populations. Risk attribution can establish anthropogenic climate change to be a key factor in Alaska coastal and riverine erosion, making possible reforms in federal disaster mitigation policies and the securing of non-competitive funds based on liability. Most importantly, risk factors can be targeted, lessened and eventually eliminated in a transition to sustainability. The villages of Alaska and climate-displaced communities elsewhere need financial and legal support. In the US currently, there is no institutional framework to relocate communities and rebuild livelihoods. Solving this problem becomes exponentially more difficult when established scientific facts and, therefore, by extension, the tools that are built on them are still pawns in political debates. In terms of continuity and building on momentum, Fran Ulmer, chair of the US Arctic Research Commission, points to the 2014 National Arctic Strategy and Implementation Plan put forth by the Obama administration as a carefully crafted starting point to promoting national and regional interests, based on lengthy input from all stakeholders. This is a plan that was developed to include the guiding principle of environmental stewardship and conservation of Arctic natural resources, the strengthening of international cooperation and continuous assessment and adaptation of the Plan. With an eye toward oil development specifically, the US Department of the Interior recently announced their “Arctic Rule” for guiding Arctic exploratory drilling regulations, to create a blueprint specific to the region above and beyond those that guide activities on the Outer Continental Shelf as defined in the 2016 “Well Control Rule”. Again, these are also regulations that were developed based on extensive input from communities and safeguarding peace and stability in the region as prime principles. While the topic of US Arctic offshore drilling is moot at the moment, due to economic feasibility under current market conditions, the pullout of several big industry names from the region, and subsequent cancellation of offshore Alaska leases for the 2017-2022 program by the Bureau of Ocean Energy Management, the Arctic Rule sets a useful precedent for standards in Arctic maritime commercial activities. Truly, we have gained a nuanced understanding of the importance of the Arctic region and this understanding has spread far past Northern latitudes: There are now over 30 observers on the Council with many more on the waiting list. Climate change is the issue with the greatest impact for the future both in terms of risks and in terms of opportunities. This understanding now must continue to drive future policies to include continuity in current US Arctic policies and concerted support of populations suffering from climate-induced displacement. A much needed reform is in the creation of a governance framework outlining when communities and government agencies should shift from protection in place (investing in infrastructure damage prevention and repairs) to relocation so as to avoid increasing the sunk-costs of climate impacts. These are no small tasks even under the best of circumstances. Effective climate governance will demand leaders who refuse to mitigate scientific facts with personal interests, and who are uncompromising in their endorsement of learning, transparency and collaboration in the public sphere. Berill Blair serves as Expert – Risk and Resilience at Polar Research and Policy Initiative. She is a researcher at the University of Alaska Fairbanks with an interest in Arctic community resilience and a background in environmental policy and natural resource management. She is a PhD candidate in natural resources & sustainability, holds a master’s degree in global environmental policy and a bachelor’s in computer science. She has over a decade of research experience accumulated through her work in Alaska. Berill’s policy interests include climate change resilience and adaptation, risk governance and Arctic geopolitics.